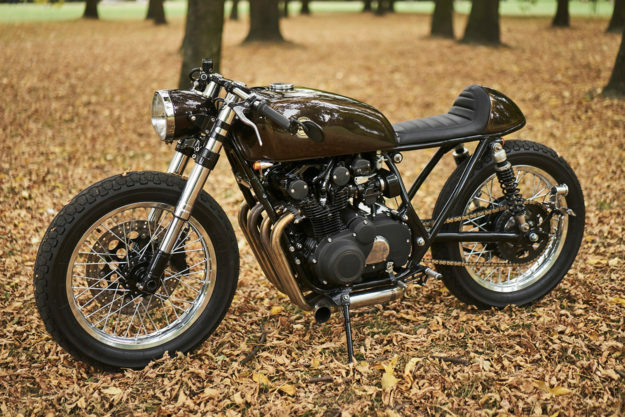 Whether you’re looking at new releases from manufacturers, or the custom scene, there’s an overwhelming bias towards scramblers right now. 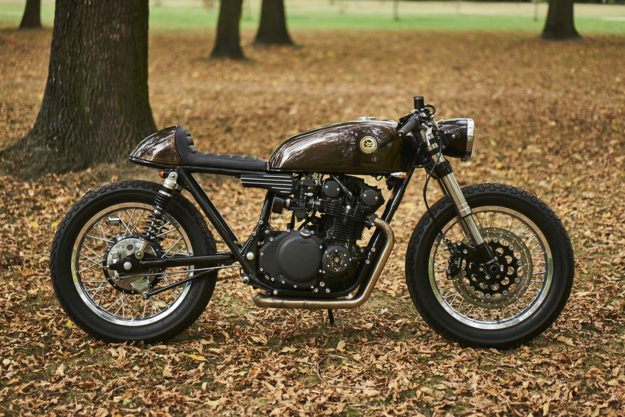 But a well-executed cafe racer still revs our motors—and this classy Suzuki GS550 from Eastern Spirit Garage just sent us into overdrive. 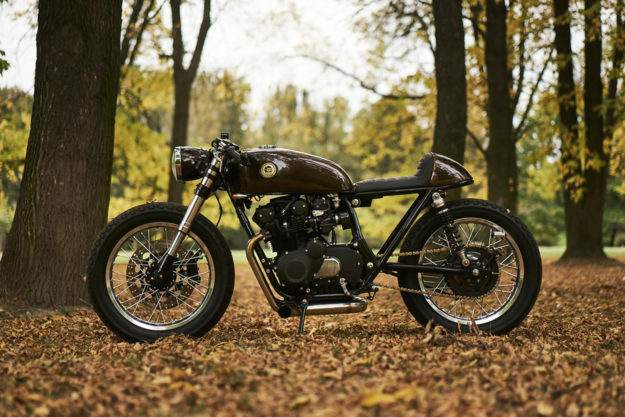 So far, we’ve only seen cafe racers from the Polish workshop. But Eastern Spirit teammates Lukas and Sylwester are totally fine with that. Those are bold words, but their work leaves little room for argument. 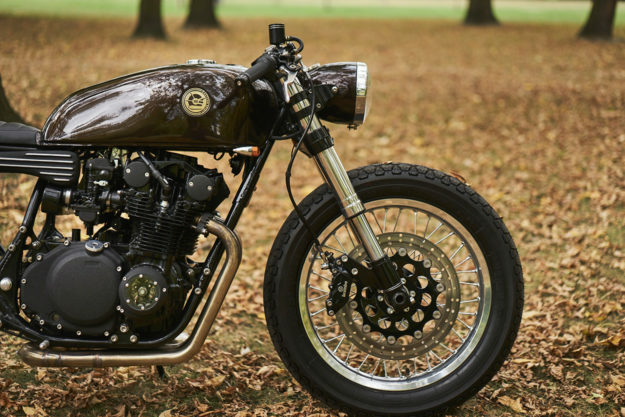 This late-70s GS550 is extremely well-balanced—following all the traditional cafe racer cues without feeling stale. Any old bike needs a little love before you bust out the angle grinder. But Eastern Spirit are pretty nonchalant about the work involved. A quick glance at the engine shows a fresh coat of paint, and a couple of interesting details. On the right you’ll notice a neat little transparent cover, and a custom-made, finned intake system. On the left, the shop’s name is subtly etched into the engine cover. Then there’s the exhaust system—a gorgeous stainless steel, four-into-one affair, that runs under the engine and doubles back on itself. The ol’ Zook’s also been treated to suspension upgrades: upside-down forks up front, and new shocks out back. The wheels have been relaced with 18” rims, and the front brake’s been upgraded to a four-pot Brembo setup. 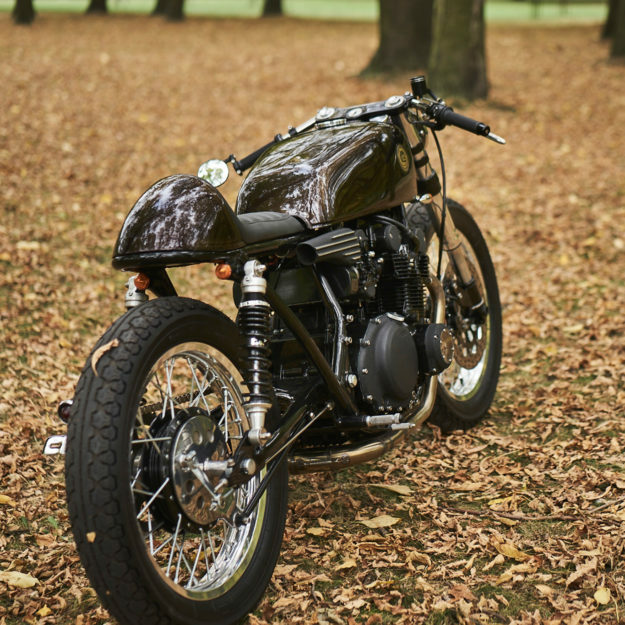 On the bodywork front, Eastern Spirit massaged the stock tank to sit better, then matched it to a hand-made tail unit. 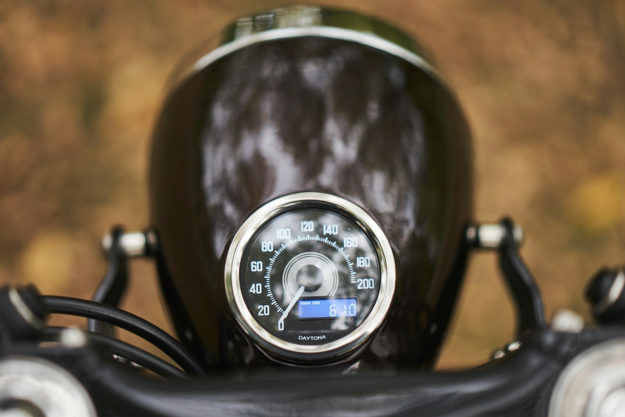 It’s perched on a custom subframe, with all the key electric components hidden to keep things airy. The tail light—and a license plate bracket—are mounted to the side. Up front, the guys installed a set of clip-ons and pared down the switches. 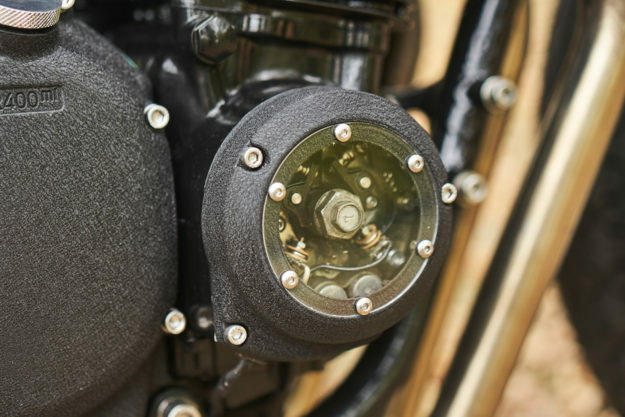 They also embedded a Daytona speedo in the headlight bucket, and the bike’s ‘idiot’ lights into a small panel welded into the tank’s neck. 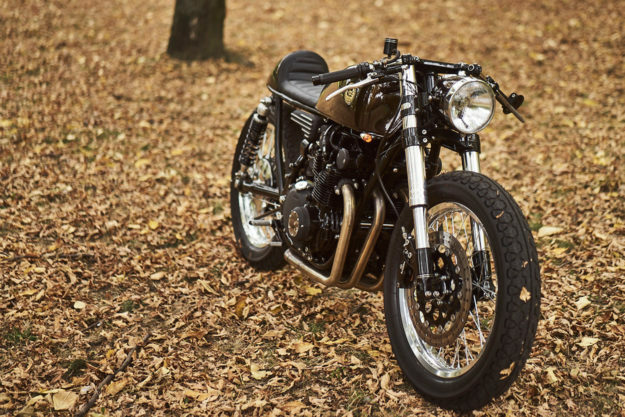 The headlight itself is from an old Polish WSK motorcycle—something that’s become a trademark for Eastern Spirit. “We’re in love with the shape,” they tell us. The final paint job is a deep bronzed brown, with a subtle gold fade creating a pinstripe effect. Every part’s been finished with careful consideration—some polished, and some blacked out. 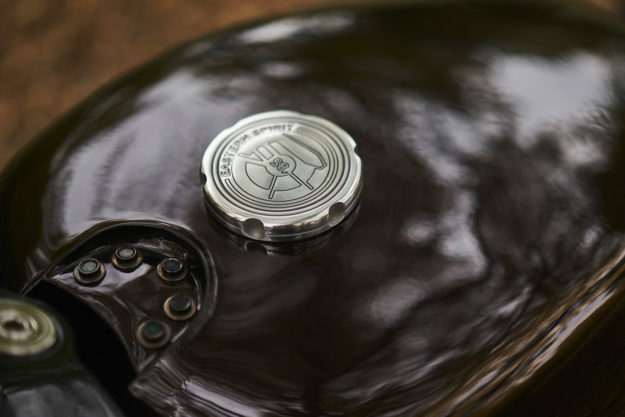 Bronze tank badges—and a gas cap bearing the company’s logo—add a final touch. We have no problem with Lukas and Sylwester sticking to one style—as long as they keep making ’em as good as this. 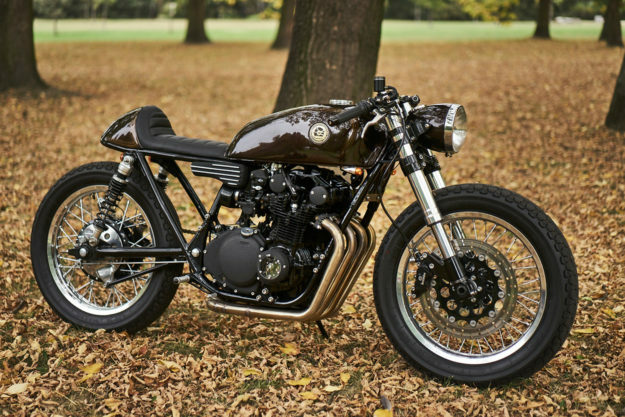 In fact, we reckon it’s time for a cafe racer revival—wouldn’t you agree?